Because there is not a large discography from which to choose, it is with great thanks to Bridge Records that this 1958, Expo ’58 (Brussels) recital from violinist Berl Senofsky and pianist Marie Louise Bastyns has been released. There’s an hour of varied repertoire that aptly chronicles Senofsky’s talents, tastes and skills. 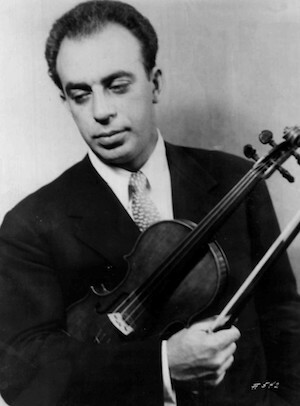 The opening Ravel (Pièce en forme de Habanera)—notable for Bastyns’ delicate touch and the violinist’s pliable, discreet lines along with tasteful portamenti—sets the bar high from the first measure. Hearing Bartók’s Roumanian Dances is like meeting an old friend dressed up in marvellously nuanced clothes, filled with abundant contrast, wonderfully accurate double stops and charming bits of hesitato (which would make actually dancing to them a challenging task indeed!). Rachmaninoff’s famous Vocalise features a “fastish” vibrato (more prevalent then than now, it seems) but is just sentimental enough. Its impassioned second subject artfully leads the way to a haunting return. Then, a far more hopeful middle section offers welcome respite. Bastyns assertively takes stage when required. The pair’s closing trill ushers in a magical finish, leading to nothingness (sadly interrupted by an over-eager audience wanting to display their early approval rather than savouring the lingering quietude). Only the occasional unwanted open string caused any concern in Ysaÿe’s Sonata for No. 6 for Solo Violin. Senofsky exudes strength and confidence from the beginning, delivering a fine balance between the dramatic/technical and lyrical sections. Overall, it’s seven minutes of impressive mastery of the instrument. Bastyns instantly lights the fire as Creston’s Suite for Violin and Piano lifts off with an engaging Prelude that exudes energy (extra-dry from the keyboard) alongside liquid-legato lines from the violin for contrast. Senofsky tosses off the treacherous triplets with aplomb. The ensuing, easy-going, song-like Air had some flavours of Bartók—the perfect tonic to the first movement. The concluding Rondo boils over with saucy fun: a merry chase with a decidedly “catch me if you can” writing (Bastyns can!). Longest work of the recital, Bach’s D-minor Chaconne is by far and away the most musically satisfying offering on the disc. Senofsky’s passionately heroic, into-the-string approach pays off in spades as he thoughtfully melds Bach’s far-reaching variants into a thoughtful whole. Just savour the result and be thankful it is available now. The final movement from Brahms’ “Thun” sonata (cross-reference below) is presented in a most amiable fashion, whetting the appetite for the whole meal.